This is a perfect vanity. 100 times better than the particle board garbage that the big box stores sell. It comes with a nice marble top and back splash, which adds to the value because any local counter top company will charge more for the marble top than this entire package costs. Solid wood construction with inlay (not overlay) style doors add to the upscale look of this cabinet. Gray is a true gray color and not blue-ish or brown-ish. Enhance the look of your bathroom with the contemporary transitional style of the Virtu Caroline Parkway wood bathroom vanity set. This vanity set is the perfect compliment to your bathroom with its brushed nickel hardware, subtle gray finish and polished chrome. 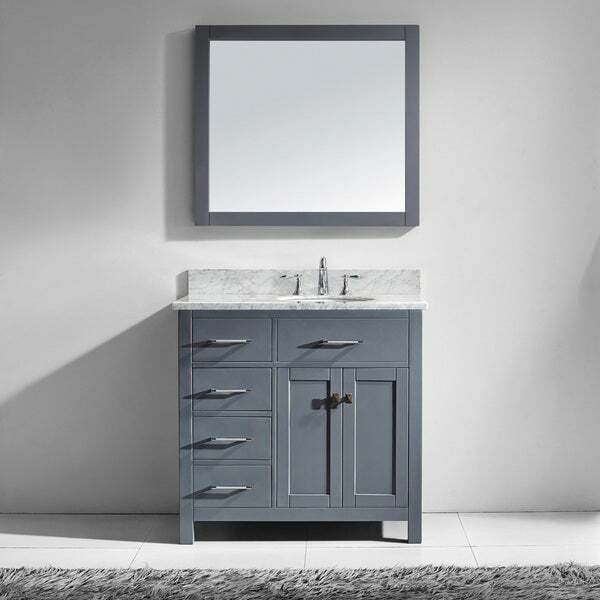 The contemporary bathroom vanity set comes complete with a single full-framed mirror and a beautiful Italian carrara white marble top that's sure to please everyone in your home. I really regret purchasing this vanity. First we received it with the sink on the right...when I thought that "left" in the description meant the sink would be on the left. The marble top had a small crack, so they sent another, but it was a completely different darker carrerra marble that didn't match my tile, so I had a custom top made. There were a couple nicks in the grey paint (Overstock gave me a whopping $$$ credit to purchase touch up paint.) The drawers don't operate very smoothly. I went ahead and installed it, but I think I will regret this purchase for a long time. "There seems to be similar questions with different answers. I want the square sink on the right, drawers on the left. What would I order to get that configuration? Left square or right square?" To receive the option with this sink on the right and drawers on the left, you can select either of the options that begin with right. Either right round or right square. Sorry for the confusion. "Please Clarify, Does the set include the sink basin and mirror the sale price? In the details of the product is states that those items are sold separately. Thank You"
sorry I was typing fast and did not proof read. Does the set include the sink basin and the mirror for the sale price?... it states that those items are sold separately. "What is the dimension from the edge of the vanity to the center of the sink? (sink is off center) Also, if I want a square sink on the right and the drawers on the left what option should I pick?" Hello thanks, the distance from the edge of the vanity to the center of the sink is approximately 12.4375 inches. The option you are seeking with the square sink on the right can be found in the drop down menu under "Right Square." I hope this info helps. Thanks for shopping with us! "Can I purchase touch up paint for this cabinet?" Hello jrehab, we do not currently carry touch up paint on our site. Thanks for shopping with us! "Based on the review and the question below, I still feel this isn't AT ALL clear as to what left and right mean. Please give a clear answer: "right Square bathroom vanity" means sink is on the right and drawers are on the left. Thank you!" Hello mmirick24, the left square and left round is the sink shape. There is an option on having a square sink or a round sink. Have a good day! I understand the shape. . . its the side that the sink is on that is unclear! Hello mmirick24, we apologize for the confusion. If you are to order the left side the sink should be on the left side and if you order the right it should be on the right side, leaving some counter top space on the opposite side. I hope this information helps, have a good day! "The options for this vanity ask if I want "left square bathroom vanity" or "right square bathroom vanity". What exactly does that mean?" Hello jwmstf, that just means do you want the drawers on the left or right. I love this vanity! Have a great day! I'm curious too because I see two conflicting answers from overstockcustomercare lol. One says that it means the side the sink is on, and the other says it's the side the drawers are on! "Does this vanity have soft close drawers, and what is the sink material?" Hello dianel, yes, the drawers are soft close, the basin is ceramic. Thanks for shopping with us!